As bloggers, content is the foundation of everything we do. It’s the way in which we teach, sell and build our influence. You can never really stop creating content and one of the constant pressures we feel is coming up new blog post after new blog post. Having fresh, fun and high-quality ideas that captivate our readers can really be a challenge at times. I’ve been a blogger for almost 8 years now. There have been times when I’ve been able to publish a post every day and stretches when blogging once a month was asking a lot. I can remember days when I would go completely blank and no matter how hard I try I just couldn’t come up with any ideas. While one of the best parts of being a blogger is the fact we’ve got the “luxury” of building a business on our own schedule but it can also be very time-consuming. So, if you are struggling to manage your monthly content or finding it hard to come up with blog post idea that drives traffic to your site and keep readers on your page, I’m giving you a massive list – 211 blog post ideas that you can use for your blog. Make sure you pin this post and bookmark this page so you can save it for inspiration – you ready? Let’s dive in! If you are a blogger looking for general ideas to build your business check out the following list of blog post ideas to jumpstart your brain and get your creative juices flowing. How’d you start your blog or business? And how did you get to where you are today? What are some of the common questions people ask you? Write out a list of FAQs. What question can you ask your users? Create a poll, survey or quiz + answer in a post. What sets your blog or business apart from your competitors? What marketing tips didn’t work for you? Have you used any new tools or applications lately? What are your go-to apps? Want more blog post ideas for bloggers, business owners, and marketers? Download your FREE 488 Blog Post Ideas Cheatsheet + Brainstorming Guide here. Your top 10 wardrobe essentials. 5 corner pieces to invest in this season. Write about what’s new in your wardrobe. Share the top 5 online stores to shop from. What you pack for a weekend getaway. The 5 accessories everyone should have in their wardrobe. Share how you organize your wardrobe? One Item Challenge. Pick one skirt/jacket/top and style 3 different outfits with it. Talk body types. Let your readers know why specific styles/cuts work for you and what you would never wear. Teach your readers how you take your outfit pics? Interview a person that helps you! Or share tips on taking pictures by yourself. What’s the best camera equipment every fashion blogger should invest in? Share some of your favorite items. What is your favorite fitness/active day outfit? Who are your top 5 fashion authorities? What are the 5 types of shoes every fashionista should own? A day in the life of a fashion blogger. Share your routine! Location Scouting. How do you find places for shooting perfect pics? Share your top tips for getting the best deals! Best ways to shop on a budget. What are top ways you promote your fashion posts? Want more blog post ideas for fashion bloggers? Download your FREE 488 Blog Post Ideas Cheatsheet + Brainstorming Guide here. If you are a beauty blogger looking for ideas to build your beauty, makeup or hair blog check out the following list of blog post ideas. What’s your skincare routine (morning and night) for the current season? What products have you recently purchased? What products have you tried lately that you loved? What products have you tried lately that you hated? Can you share your weekend/minimal/”no makeup” makeup routine? Your party/special occasion makeup routine? What are your daily haircare products and tools? Which products from (insert store here) do you love and highly recommend? Have you tried any popular products lately? Were they worth the hype? What are your favorite products for certain skin/hair? What are your favorite products for a certain health concern? What were your favorite products/brands from when you were growing up? Hauls from different stores or brands. What is your go-to nail polish picks for the season? What about your favorite scents for the season? Makeup or skincare recommendations for certain people or occasions. Beauty lessons or tips that you swear by. A roundup of brands you want to try. Want more blog post ideas for beauty bloggers? 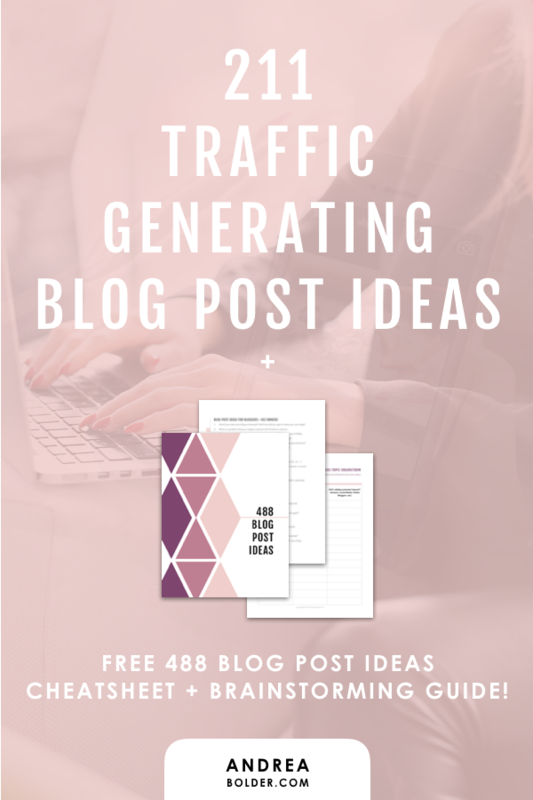 Download your FREE 488 Blog Post Ideas Cheatsheet + Brainstorming Guide here. Can you share the story behind your story? How you stay inspired and how other writers can do the same. Your grammar and usage pet peeves. Challenges of the writing life and how you have overcome them. Favorite happy (sad) ending from a book. The first book that made you wanted to be a writer. The craziest thing you’ve ever done when doing research for a book. Share a book event (or writing conference) you recently attended. Compile a list of quotes from books you recently read. Share your experience with a book group/club. How do you stay focused during long writing sessions? How you organize your bookshelf? How you keep track of all the books you read? Things that inspire you that have nothing to do with printed words. What your desk looks like and why? Some favorite items in your office. Can you share what happened when you met one of your favorite authors? How you feel when other people are talking about your writing. How to Host a contest for readers to encourage them to leave comments/reviews. What are some tips you can share on cross-promoting your blog with other writers? How to host your favorite authors as guest bloggers on your website. How to include social media “follow me” icons in your blog posts. How to create blog posts that link to your online publications. How to use your blog to promote your digital freebies and grow your mailing list. Want more blog post ideas for writers and authors? Download your FREE 488 Blog Post Ideas Cheatsheet + Brainstorming Guide here. If you are a photographer looking for ideas to build your beauty, makeup or hair blog check out the following list of blog post ideas. A day in the life post. Your photography story + why you decided to become a photographer. How you edit your photos and what software you use? What are your top tips for purchasing photography gear? Your best (worst) photography purchase (ever)! Why you chose the camera you photograph with. The biggest thing you learned about photography. Share a variety of before/after edits. Photography classes or workshops you’ve attended. Which ones do you recommend? Talk about Color vs. black + white photography. How to photograph in low light. Tips for photographing food, kids, newborns, weddings, special events. Tips for photographing with your phone. Top apps you use. Share a photography secret (trick or hack) that helps you take better pics. Your favorite lens to use. Tips for photographing a vacation. Share your favorite photographs you’ve taken and why you love them. Share photographs when you first started photographing + what you’ve learned since. What photographers (celebrity photographers) inspire you and why? How you plan a photography session? Talk about your photography style and how you developed it. Share why you started your photography business. What are your favorite phone photography accessories? Want more blog post ideas for photographers? Download your FREE 488 Blog Post Ideas Cheatsheet + Brainstorming Guide here. Share how you got started cooking+ why you love to cook (your foodie story). Write a seasonal post or recipe. Share your favorite food blog sites. Replicate a recipe and write about the experience/outcome. Share a quick baking or cooking tip. Try a difficult technique you’ve always wanted to try and write about it. Write a recipe round up (with proper permissions and credits, of course). Review a local restaurant or bakery. Write a post about your baking and cooking essentials. Compare cooking products or utensil brands. Create a recipe series based on a single ingredient. Write about healthy replacements for unhealthy foods. Collaborate with another food blogger on a recipe or series of recipes. Bake or cook with a family member or friend and blog about it. Interview a popular chef, fellow blogger, baker, or cook. Recreate a recipe from Pinterest and review it. Write about your favorite childhood recipe (include the recipe). Create a recipe with an unusual or exotic ingredient. Try making a foreign or regional dish. Take a cooking class and blog about the experience. Participate in a food challenge or charity event and write about it. Want more blog post ideas for your food blog? Download your FREE 488 Blog Post Ideas Cheatsheet + Brainstorming Guide here. If you are a lifestyle looking for ideas to build your blog, check out the following list of blog post ideas for lifestyle bloggers. Write a 10 things you probably don’t know about me post. Share your top 10 favorite movies. What’s on your travel bucket list. How you pack a suitcase. Share a favorite childhood memory. Share an interview with someone you admire. Inspirational quotes and/or your thoughts on them. Outfit of the day posts. Share your favorite recipe or the moment post. Share a few embarrassing stories with your readers. What local restaurants are you digging right now? Friday favorites post where you link to your favorite articles/sites from that week. Do a 10 things I can’t live without post. What are your top 5 beauty products of all time. Read a book lately? Do a book review. Feeling romantic? Share a date ideas post. Weekend snapshot post where you share with your readers what you did that weekend. Share your monthly goals, income reports, progress reports. What are the top Lifestyle Podcasts your readers need to listen to. Share with your readers your biggest success in life so far. Talk about an important life lesson you’ve learned recently. Share your top exercises for burning belly fat. Fitness products every fitness enthusiast should own. Your top 5 apps to help you get fit. The supposedly healthy foods you should be avoiding. List the common misconceptions about exercise. Name the best pieces of exercise equipment for your home. Quick and easy exercises for people who don’t have time to workout. The best vitamins (supplements) to help shed the weight. How to train for your first 5k. The best foods for building muscle. The best health and fitness magazines to read. The top Pinterest fitness boards for inspiration. The top 10 cardio exercises you use to cut fat quickly. The best and worst diets you have tried. Need a job? Amazing fitness related jobs and how to get them. Low impact exercises you can do at the office. 10 best exercises to build your core. Surprising facts you’ve learned as a fitness blogger. The Ultimate Guide To Becoming A Personal Trainer. 15 nutritional tips for people trying to live a healthier life. What are some of the best fitness books you’ve read. 5 best workout looks for going to the gym. How to turn any space in your home into a home gym. Top reasons why you should start working out today. How to plan your monthly exercise calendar. You top resistance training exercises for beginners. Your top 5 cleansing diets that work wonders for weight loss. Want more blog post ideas for your fitness blog? Download your FREE 488 Blog Post Ideas Cheatsheet + Brainstorming Guide here. Love this! I will definitely be using this as a resource! I didn’t get the 488 Ideas either. Perhaps there’s a glitch in your autoresponder? Thank you so much for your generosity–you have awesome, helpful content! Hi dear Andrea… once again you present us with super creative and useful content! I got so curious to descover the other ideas, so asked for the ebook, but it did not arrive … what might have happened? Hi Ellen! Oh no! I am not sure what happened but there was a glitch in my autoresponder. You should have received an email with a link to download the guide. If you do not see it soon, either re-optin or check in The Profitable Entrepreneur Facebook Group – I will be posting the link there on monday!